Unfortunately, the youth of today mostly don’t know that counterculture hero Hunter S Thompson wasn’t just fictionalised on screen by Jack Sparrow himself, Johnny Depp; although I’m sure those of interest would be over-joyed to discover that ever-present counterculture hero Bill Murray actually played the man in this 1980 cult classic. Were they all to know, I’m sure there’d be renewed interest in this piece; the question being whether it’s worth the time or energy. Where the Buffalo Roam is both underrated and probably just-about-rated-right. 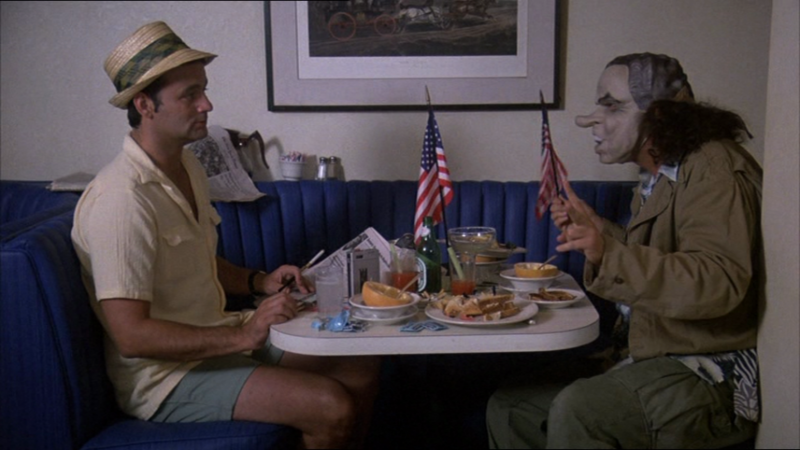 The story follows Thompson and his former attorney and friend Carl Lazlo Esq (Peter Boyle) as they run roughshod over the United States during the tumultuous 60s and 70s, ostensibly revealing the country’s many hypocrisies and inherent ridiculousness, unobserved by its ruling classes. They find themselves in situations such as royally unfair drug trials stemming from San Francisco’s beatnik underground, to impromptu bathroom interviews with Richard Nixon. Art Linson, known in recent years for his Producing credits on edgy fare such as Fight Club and rather more lofty movies like Into the Wild, directs Buffalo with a heavy bent toward the satirical, amping up every weird moment in the script by evidently asking his actors to turn it way down or turn it way up. The supporting actors tend to turn it down, leaving it to a positively-immersed Murray to turn it up, along with Boyle, who is very clearly having a ball. Boyle is perhaps the standout here, selling a succinct kind of exasperation along with a maniacal side that simmers under the surface. He remains a more understandable, and, gasp with me now – relatable character than was felt with Benicio Del Toro’s altogether more insane performance in Fear and Loathing. Murray almost lets the team down by disappearing so completely into the role; as legend would have it he embedded himself by Thompson’s side in real life, absorbing all the tenets of his personality along with his mannerisms and mode of speech. The latter is the problem, as Murray’s impersonation – which is probably near enough spot-on to the real man – doesn’t translate to screen, nor the audio capabilities of early 1980s cinematic technology. His constant mumbling and speaking around the cigarette holder permanently wedged in his mouth make most of his lines nigh-on unintelligible. Depp obviously learnt from the mistake, sneering his way around the script for Fear and Loathing rather than giving the back-of-the-throat Elvis-like rumble Murray does. You almost expect to go “uh huh-huh”. Where the Buffalo Roam should be seen for the performances (or what you can understand of them), the enjoyable satirical take on the late 60s from a point-of-view occurring only ten years later, and the meandering script, as crazy and random as Thompson’s work itself, funny as hell and as quotable as Hunter S. Thompson flick should be. It’s like watching a series of visual non-sequiturs, enjoyable and amusing whilst maintaining an arm’s distance from the viewer, unable to allow itself to draw you in completely. Where the Buffalo Roam is available on DVD and Blu-ray now.